Disc used to polish most metal and plastic surfaces. Using No.421 polishing compound with wheels produces a high luster. Use with No.401 mandrel. Do not run in excess of 30,000 RPM. 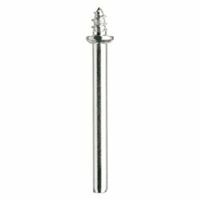 Dremel Mandrel, Suitable For Use With: 414, 422 and 429 Dremel Accessories, 1/2 in Head Size Sanding Band covered with 60 grit aluminum oxide abrasive. Use for rough shaping, smoothing wood or fiberglass, removing rust from metal surfaces and shaping rubber surfaces. Bands are easily replaceable on drums. Do not use in excess of 30,000 RPM. Compact and lightweight. Tool runs from 5,000-32,000 RPM. Managed by a variable speed dial for fluid control. 1/8" Collet is compatible with all 1/32" - 1/8" shank accessories providing the user access to any cutting, grinding, sanding and polishing solutions. Includes rotary tool, M12 Redlithium battery, 5 cutting wheels and mandrel, wrench and 30-minute charger and carrying case.